I've thrown out a challenge to the followers of every other NFL out there: tell us why your team will be better than the Pittsburgh Steelers in 2007. And plenty of eager writers are lined up to tell you exactly why they will be superior to the Black and Gold. In the coming weeks, be prepared to get a gauge on exactly where the rest of the country ranks us in the NFL hierarchy this season. 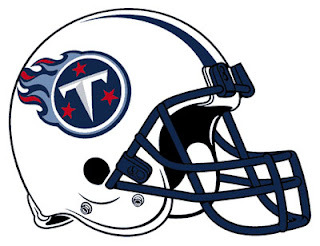 Here are the top ten reasons why the Titans will be better than the Steelers. We don't really need to list that many reasons, but if Letterman uses ten, we might as well too. The main difference is, we don't count backwards in Tennessee, like Letterman was taught in Indiana or Baltimore or wherever he came from. 1. Forget the last meeting two years ago. Both teams have had a lot of roster turnover since then with the Steelers now being only a shell of that championship team. Pittsburgh is on the way down while Tennessee is going up. 2. The Titans now have Superman wearing jersey number 10 and playing quarterback. Pittsburgh's quarterback can't ride a bike without falling off. 3. The Titans have your boy Chris Hope. Maybe you didn't appreciate him like you should have, but we sure do. Thanks for letting us have him. Too bad that Steelers fans have a team that's cheap. 4. The Steelers have lost a lot of other good players too. Kimo, Porter and Randle El are gone. Faneca has one foot out the door already. The Bus is parked in the garage. 5. LenDale White. He would have made a good replacement for the Bus. Your front office "brain trust" passed on him and LenDale's got a chip on his shoulder about that. The Titans have him now and he'll make you pay. 6. You've also lost Coach Leno. We still have Jeff Fisher. 7. Fisher was born in raised in Los Angeles and went to school at USC,so he probably spent a lot of time in Hollywood and learned about acting. Who do you think gave those acting lessons to Joe Nedney? That's what Coach Chin blamed that loss on. 8. The Titans don't need Nedney anymore, since they now have a better guy who kicks 60-yard field goals. Nedney's in San Francisco now, so I guess that makes the 49ers better than the Steelers too. 9. Pacman Jones. He's on vacation this year, but he'll be back when the Titans play the Steelers next year. You're lucky that game's not in Pittsburgh or Pacman would visit your night clubs and make it rain. 10. Too bad the Steelers won't make the playoffs this year so we can meet you there. It looks like you're still a couple of years away from drawing even with the Ratbirds and Bungles in your own division. I guess you'll have to wait awhile before you make the playoffs again,only to have the Titans eliminate you again. At least the space bars work on our keyboards. And as old as your insults were (Big Ben motorcycle jokes expired by week 10 of last season, and most of us didn't realize that Chris Hope left), you should have made some references to Earl Campbell or Warren Moon... you know, the real Oilers. You're right. LenDale White does have a chip on his shoulder. Along with about 6" of an Italian Sub sandwich, and half of a cocolate chip cookie that fell out of his mouth during camp. "6. You've also lost Coach Leno. We still have Jeff Fisher." And Jeff Fisher has won what exactly? It's a shame you don't have Nedney anymore. He could flop to the ground to draw a penalty like nobody's business. How could you leave out #11 Kige Ramsey is a Titans fan? Titans games, where you can divide the number of teeth by the number of shoes and it equals about 1. Really, a 36 year old unspectaclar defensive lineman (that's been gone for over a year) is the first player you could name that the Steelers will miss? I wonder if those that write these articles even believe half of it. I don't understand why everyone thinks Faneca's going to have a bad year. He wants to get paid. Better play = more money. If he's healthy, this will be one of the best of his career. Wow. That rundown was even more hapless than Vince Young's wonderlic test. I was half expecting to see a letter to Santa tacked on the end of it. Just wow. What a joke; the Titans aren't even better than two of the three other teams in its own division. This post was just plain awful. The term "reaching" doesn't aptly describe the tone and content of his post. The whole idea is lacking in relevance. How many Steeler really care about the Titans or Rams? Why don't we just compare Missouri to Pitt? Or UCLA to Penn State?